Prepare for the Ark Update with New Events | Dexless, Maplestory Guides and More! Discussion in 'Maple Updates' started by Nexon, May 30, 2018. Get ready for the Ark update coming this summer! Although there are a few weeks until Ark releases, you can participate in new events happening now! Visit the Ark site to learn more about the newest content including new character Ark, Esfera, Grand Athenaeum: Episode 5, system changes, and more! Participate in special events to earn lots of free prizes! Exciting events are happening in-game too, so read on to join the fun now! Visit the Ark site to walk through Maple World! When you share news from the site on social media, you will instantly receive a special reward sent to your account in-game. 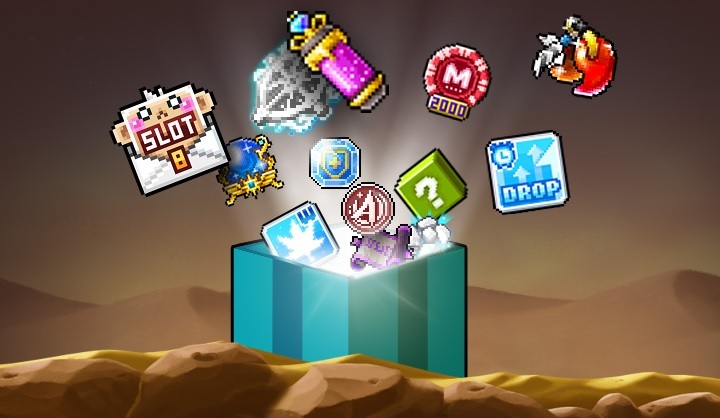 You can retrieve it by logging in to MapleStory on any world and clicking the gift-box notifier on the left-side of the game window to collect your item. Not all pages are ready for sharing yet so check back on each page’s listed date. Mega Character Burninator: (Tradeable within account. 7-day duration.) Use to grant Mega Burning status to the current character. Status lasts 14 days and grants 2 additional levels with every 1 level-up made between Lv. 10 and 149. Can’t be used on Zero characters. Item is consumed upon use. Arcane Symbol Selector Coupon: (Tradeable within account. 7-day duration.) Use to select an Arcane Symbol to receive from one of the regions you have completed. Item is consumed upon use. Spell Trace 100 Coupon (x6): (Untradeable. 7-day duration.) Use a coupon to receive 100 Spell Traces. Coupon is consumed upon use. Nodestone (x2): (Untradeable.) Use the Nodestone to receive one random Node. Item is consumed upon use. Kin Ring (7 Day) Coupon: (Untradeable. 7-day duration.) Use this coupon to receive a 7-day Kin Ring. Equip to earn 10% bonus EXP. When you're in a party, you and all your party members will get an extra 5% bonus EXP. Coupon is consumed upon use. Character Slot Expansion Coupon: (Untradeable. 7-day duration.) Use to receive one additional character slot in the given world. Your account may hold a maximum of 46 character slots per server world. Coupon is consumed upon use. Special Medal of Honor (x2): (Untradeable. 7-day duration.) Use to receive Honor EXP. Item is consumed upon use. Trait Boost Potion (x2): (Untradeable. 7-day duration.) Use to select one trait among Ambition, Empathy, Insight, Willpower, Diligence, and Charm, and significantly increase it. Item is consumed upon use. Onyx Apple (x3): (Untradeable. 7-day duration.) Use to recover 90% HP & MP, and provides Weapon ATT/Magic ATT +100, DEF +20 for 10 minutes. Hyper Teleport Rock: (Untradeable. 7-day duration.) Use to teleport to most locations through the World Map. You can also use it to move to a map where a specified character is (same world and channel). This item can be used repeatedly until it expires. 3x EXP Coupon (15 min): (Untradeable. 1-day duration.) Use to receive a 3x EXP buff for 15 minutes. Coupon is consumed upon use. That’s not all—complete all the steps to earn a FREE MapleStory Ark Share Box when Ark is live! Ark Coin (x200): (Untradeable.) These coins can be used to purchase items from the Ark Coin Shop event. 1-Hour 2x EXP Coupon (x6): (Untradeable. 7-day duration.) Use to receive a 2x EXP buff for 1 hour. Coupon is consumed upon use. 1-Hour 2x Drop Coupon (3) (x2): (Untradeable. 7-day duration.) Use to receive three 2x Drop buff coupons that last for 1 hour when used. Coupons are consumed upon use. Safety Gem Coupon: (Untradeable. 30-day duration.) This item prevents you from losing EXP points if your character dies, and restores 30% of your HP and MP once you are revived. It can be used repeatedly until it expires. Respawn Pass Coupon: (Untradeable. 30-day duration.) This item lets you respawn in the same map in which your character died. It can be used repeatedly until it expires. Buff Freezer Coupon: (Untradeable. 30-day duration.) This item allows you to keep the buffs you had if your character dies. It is consumed upon use. Miracle Circulator x3 Coupon: (Tradeable within account.) Use to receive Miracle Circulator (x3) each with a 3-day duration. Coupon is consumed upon use. Epic Potential Scroll 100%: (Tradeable within account.) Use scroll to give Epic Potential to items that are ranked Rare or below. Mysterious Storm Growth Potion: (Tradeable within account. 7-day duration.) Use to gain 1 entire level. It can be used by players between Lv. 100 and 199. It is consumed upon use. 2000 Reward Points Token (x3): (Untradeable. 7-day duration.) Use to receive 2,000 Reward Points per token, for a total of 6,000 Reward Points. Token is consumed upon use. Nodestone (x5): (Untradeable.) Use the Nodestone to receive one random Node. Item is consumed upon use. Power Elixir x100 Coupon (x10): (Untradeable. 10-day duration.) Use to receive 100 Power Elixirs. Coupon is consumed upon use. 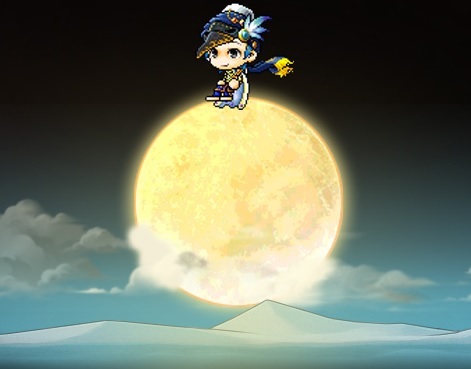 Mapler on the Moon Chair: (Untradeable.) Be master of the moon with this shining chair! Earn useful items daily with the Ark Attendance Check! Players Lv. 33 and above can begin by accepting the quest from the event notifier on the left-side of the screen. Hunt monsters within your level range (20 levels below and 20 levels above) to complete the day’s attendance and receive a stamp. Earn rewards including a Special Medal of Honor, Meister's Cube, Ark Coins, Nodestones, 2x EXP Coupons, Spell Traces, Mysterious Meso Pouches, scrolls, and more. This event can be completed once per day per world. Join other Maplers in a Monster Hunting community event! Participate in the Ark Attendance Event, and every time you complete a day’s attendance, the number of monsters you hunted will get counted on the Ark site! Defeat huge amounts of monsters and reach each monster-hunting goal to unlock rewards for the whole community in a scheduled maintenance after Ark is live. Only one gift pack will be given, depending on the highest tier reached. 1000 Reward Points Token (x2): (Untradeable. 7-day duration.) Use to receive 1,000 Reward Points per token, for a total of 2,000 Reward Points. Token is consumed upon use. Buff Freezer Coupon: (Untradeable. 30-day duration.) Use this coupon to receive Buff Freezer (x2). This item allows you to keep the buffs you had if your character dies. It is consumed upon use. Item has 90-day duration. Ark Coin (x25): (Untradeable.) These coins can be used to purchase items from the Ark Coin Shop event. Hair Color Coupon (REG) Voucher: (Untradeable. 30-day duration.) Use this voucher to receive a Hair Color Coupon (REG). Use it at a Hair Salon in major towns to receive a random hair color. Coupon is consumed upon use. Coupon has a 7-day duration. Hair Style Coupon (REG) Voucher: (Untradeable. 30-day duration.) Use this voucher to receive a Hair Style Coupon (REG). Use it at a Hair Salon in major towns to receive a random hairstyle. Coupon is consumed upon use. Coupon has a 7-day duration. Face Coupon (REG) Voucher: (Untradeable. 30-day duration.) Use this voucher to receive a Face Coupon (REG). Use it at a Plastic Surgery center in major towns to receive a random face. Coupon is consumed upon use. Coupon has a 7-day duration. Spell Trace 100 Coupon (x2): (Untradeable. 7-day duration.) Use a coupon to receive 100 Spell Traces. Coupon is consumed upon use. Nodestone (x3): (Untradeable.) Use the Nodestone to receive one random Node. Item is consumed upon use. Monster Park Additional Entry Ticket Coupon: (Untradeable. 30-day duration.) Use this coupon to receive a Monster Park Additional Entry Ticket which can be used to gain additional entry to Monster Park dungeons. Ticket is consumed upon use. Item has a 90-day duration. Selective 8 Slot Coupon (x2): (Untradeable. 7-day duration.) Use to expand an inventory tab of your choice by 8 slots. Cannot be used on Storage. Coupon is consumed upon use. Buff Freezer Coupon: (Untradeable. 30-day duration.) Use this coupon to receive Buff Freezer (x3). This item allows you to keep the buffs you had if your character dies. It is consumed upon use. Item has 90-day duration. Ark Coin (x50): (Untradeable.) These coins can be used to purchase items from the Ark Coin Shop event. Spell Trace 100 Coupon (x5): (Untradeable. 7-day duration.) Use a coupon to receive 100 Spell Traces. Coupon is consumed upon use. Monster Park Additional Entry Ticket Coupon (x5): (Untradeable. 30-day duration.) Use this coupon to receive a Monster Park Additional Entry Ticket which can be used to gain additional entry to Monster Park dungeons. Ticket is consumed upon use. Item has a 90-day duration. Miracle Circulator x3 Coupon (x3): (Tradeable within account.) Use to receive Miracle Circulator (x3) each with a 3-day duration. Coupon is consumed upon use. Mini Yeti Coupon: (Untradeable. 30-day duration.) Use this coupon to receive a little Mini Yeti pet to keep you company! Comes with Meso Magnet and Item Pouch skills. Pet has a 30-day duration. Mysterious Storm Growth Potion: (Tradeable within account. 7-day duration.) Use this item to gain 1 entire level. It can be used by players between Lv. 100 and 199. Item is consumed upon use. Ark Coin (x150): (Untradeable.) These coins can be used to purchase items from the Ark Coin Shop event. Selective 8 Slot Coupon (x3): (Untradeable. 7-day duration.) Use to expand an inventory tab of your choice by 8 slots. Cannot be used on Storage. Coupon is consumed upon use. 1000 Reward Points Token (x3): (Untradeable. 7-day duration.) Use to receive 1,000 Reward Points per token, for a total of 3,000 Reward Points. Token is consumed upon use. Arcane Symbol Selector Coupon (x2): (Tradeable within account. 7-day duration.) Use to select an Arcane Symbol to receive from one of the regions you have completed. Item is consumed upon use. Hair Color Coupon (VIP) Voucher: (Untradeable. 30-day duration.) Use this voucher to receive a Hair Color Coupon (VIP). Use it at a Hair Salon in major towns to receive a hair color of your choice. Coupon is consumed upon use. Coupon has a 7-day duration. Hair Style Coupon (VIP) Voucher: (Untradeable. 30-day duration.) Use this voucher to receive a Hair Style Coupon (VIP). Use it at a Hair Salon in major towns to receive a hairstyle of your choice. Coupon is consumed upon use. Coupon has a 7-day duration. Face Coupon (VIP) Voucher: (Untradeable. 30-day duration.) Use this voucher to receive a Face Coupon (VIP). Use it at a Plastic Surgery center in major towns to receive a face of your choice. Coupon is consumed upon use. Coupon has a 7-day duration. Spell Trace 100 Coupon (x8): (Untradeable. 7-day duration.) Use a coupon to receive 100 Spell Traces. Coupon is consumed upon use. Nodestone (x15): (Untradeable.) Use the Nodestone to receive one random Node. Item is consumed upon use. Monster Park Additional Entry Ticket Coupon (x10): (Untradeable. 30-day duration.) Use this coupon to receive a Monster Park Additional Entry Ticket which can be used to gain additional entry to Monster Park dungeons. Ticket is consumed upon use. Item has a 90-day duration. Miracle Circulator x3 Coupon (x5): (Tradeable within account.) Use to receive Miracle Circulator (x3) each with a 3-day duration. Coupon is consumed upon use. Intense Damage Skin: (Untradeable.) Use to apply a new damage skin over your damage meters. Item is consumed upon use. 1000 Reward Points Token (x4): (Untradeable. 7-day duration.) Use to receive 1,000 Reward Points per token, for a total of 4,000 Reward Points. Token is consumed upon use. Cash Shop 30% Off Coupon: (Untradeable. 30-day duration.) Use this coupon to save 30% off the price of one item in the Cash Shop. Coupon is consumed upon use. Mysterious Storm Growth Potion (x2): (Tradeable within account. 7-day duration.) Use this item to gain 1 entire level. It can be used by players between Lv. 100 and 199. Item is consumed upon use. Ark Coin (x250): (Untradeable.) These coins can be used to purchase items from the Ark Coin Shop event. Selective 8 Slot Coupon (x4): (Untradeable. 7-day duration.) Use to expand an inventory tab of your choice by 8 slots. Cannot be used on Storage. Coupon is consumed upon use. Royal Hair Coupon Voucher: (Untradeable. 30-day duration.) Use this voucher to receive a Royal Hair Coupon. Big Headward of Henesys Hair Salon will give you a random hairstyle in exchange for this coupon. Double-click it in the Cash Shop for a preview. Coupon is consumed upon use. Coupon has a 7-day duration. Royal Face Coupon Voucher: (Untradeable. 30-day duration.) Use this voucher to receive a Royal Face Coupon. Nurse Pretty of Henesys Plastic Surgery will give you a random face style in exchange for this coupon. Double-click it in the Cash Shop for a preview. Coupon is consumed upon use. Coupon has a 7-day duration. Spell Trace 100 Coupon (x12): (Untradeable. 7-day duration.) Use a coupon to receive 100 Spell Traces. Coupon is consumed upon use.